They are also the proper configuration for NRA, SASS, and BPCR sanctioned competition. We have eliminated the use of the cumbersome leather cradle/barrel support and predetermined adjustment holes. 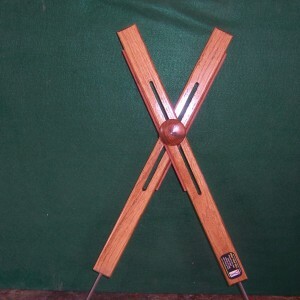 The height can be quickly adjusted by loosening and sliding the clamp knob up or down in the groove. You will love the quick and easy “slide adjust” to the perfect height. Cat’s Shooting Sticks are individually hand crafted from solid oak 1 x 2’s. A 3/8″ wide leather strip on each stick protects the finish of the rifle barrel and helps hold the rifle barrel in position. 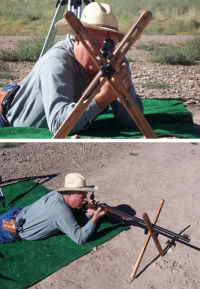 Total length of the prone sticks are approximately 23″. This includes 6″ spikes inserted into the bottom with approximately 2 3/4″ protruding so they can be easily pushed into the ground for a solid shooting position.